Much like any other language, the Thai Language is broken into Consonants, as those listed in the Thai Alphabet – and vowels. Consonants in Thai are categorized into three groups or classes called Middle Consonants, High Consonants and Low Consonants. It is important to remember which class a consonant belong to as the class of the initial consonant in word will partly determine the tones of that word. For more information on the tones of the Thai language please click Thai Tones. Please click on the letter of the Alphabet to hear the sound. It may take a little time for the sound file to download. 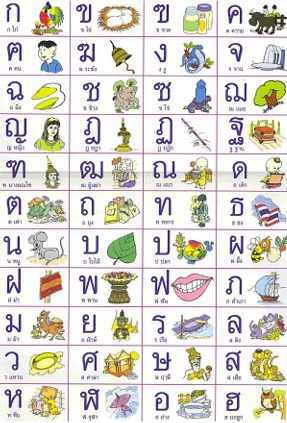 We hope you enjoy this Thai Alphabet sound resource. For more information and Free Thai lessons please go to our Facebook, Twitter, YouTube or Blog websites. Should you wish to take formal lessons to learn Thai Script or conversation Thai then please try us with a no-obligation trial lesson. We can help you master this beautiful language with confidence with lessons online wherever you are. About 80% of our students rebook – see what they say about us.